Last weekend, the Girl, a friend, and I hiked from NV 28 down to Chimney Cove and Secret Cove. This was captured by my friend. Last Sunday (yep, already nearly a week passed), the Girl, a friend, and I drove up to the parking area for a trail that drops from the highway down to Chimney Cove, Secret Cove, and beyond. We hiked down the trail, encountering a few sleepy campers and some not so sleepy early-risers like ourselves. It was a gorgeous summer morning at Lake Tahoe, just cool enough to make me want a sweatshirt part of the way. When it warmed, I stuffed the sweatshirt into my pack. 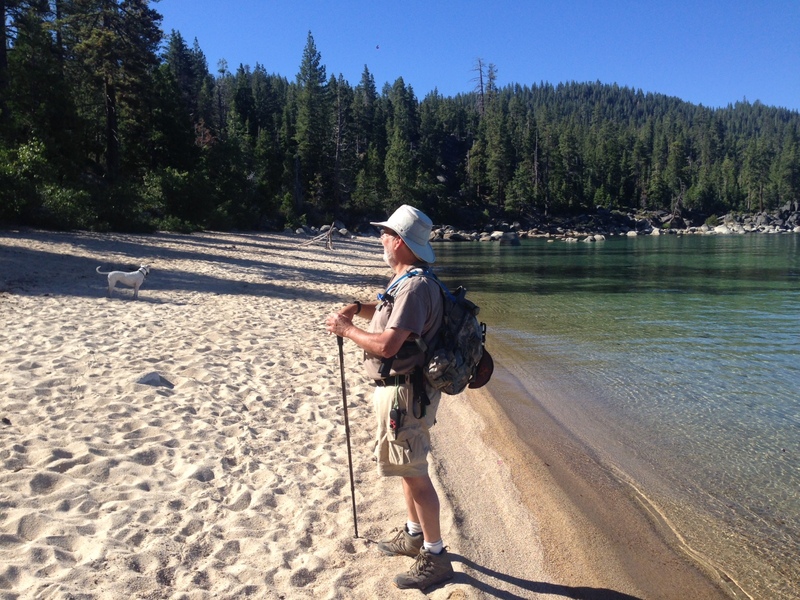 The Girl didn’t need water (plenty in Lake Tahoe), but I used my hydration bladder a bit to stay hydrated. The loop was about three and a half miles, which is nearly perfect for me. What a fun hike and a great memory.